I’ve had the most wonderful time on this trip and made some really great new friends! I enjoyed it so much that I almost hated to see it come to an end! I worked with an awesome group of people on my watch who were always full of information! 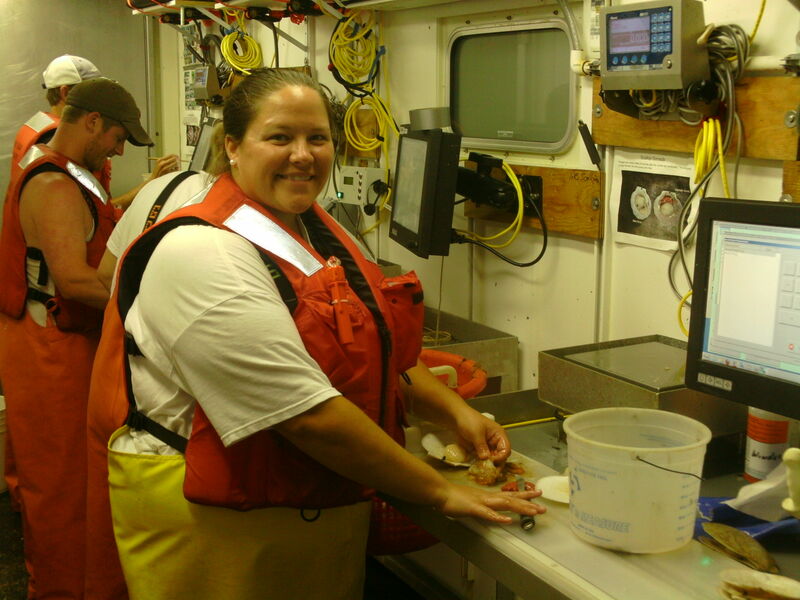 Erin has a marine biology degree, as well as a technology graduate degree. She was great to talk to, learn from, and she always helped me make the right decisions. Adam was our watch chief on the day watch crew, which means that he was responsible for collecting data and directing the rest of the science crew as we sorted the contents of the dredge. He was always very helpful and knowledgeable about the different types of species that came up with the dredge. Jon was the chief scientist for the leg 3 sea scallop survey. Jon had a very busy job because he was in charge of both science crews, communicating with the home lab, collaborating with the ship crew, deciding on dredge spots and HabCam routes, and for showing me the ropes. I really do appreciate all the time he took out of his busy days to help me and teach me! Jared was the HabCam specialist on board for this leg of the sea scallop survey. He has an ocean engineering degree and works for WHOI, which is the Woods Hole Oceanographic Institute. Jared helped design and test the HabCam vehicle so that it would protect the camera and other equipment while underwater. He also kept our crew entertained with ‘tunes’ and laughs. This group of people was great to work with and I would do it again with them in a heartbeat. I really hope that I will get another opportunity to do something like this again in the future! 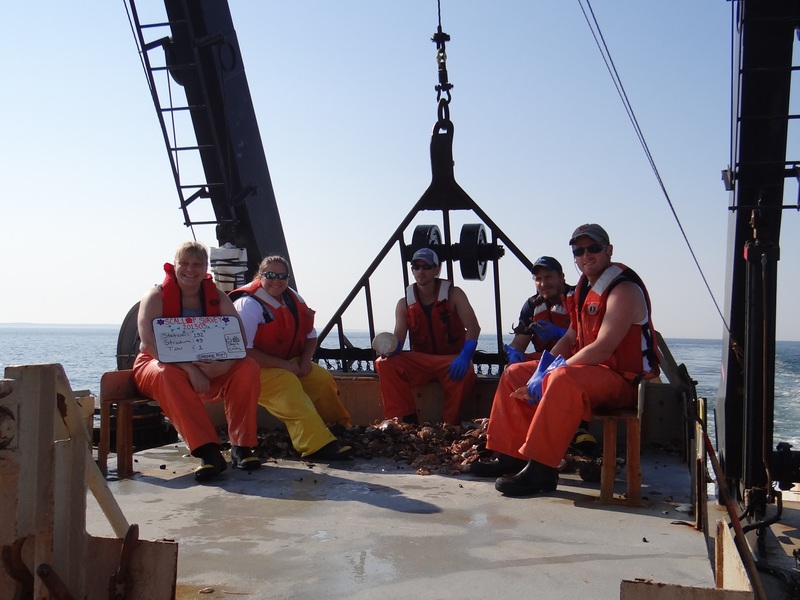 The day watch science crew taking the last dredge picture of the Leg 3 Sea Scallop Survey. I also really enjoyed the crew of the Hugh R. Sharp. They were always welcoming and forthcoming with answers to questions about the ship. They also keep their ship clean and comfortable. My favorite place on the ship was the bridge, which is where they steer the ship. The bridge is the best place to watch for whales and sharks. It has panoramic glass all the way around it, plus you can walk right outside the bridge and feel the breeze in your face, or have some very interesting conversations with the ship’s crew. As my trip came near to an end, I started wondering what were some of the differences between the research dredge we were using and the dredge a commercial scallop fisherman would use. Our research dredge was an 8 foot New Bedford style dredge, as opposed to the commercial ships who use two 15 foot dredges on either side of the ship. Scallop dredges are made up of connecting rings that keep the scallops in the dredge. The research dredge we used was made up of 2 inch rings. Commercial dredges are required to have a minimum of 4 inch rings. NOAA uses the smaller rings on their research dredges to be able to get an accurate population count of all the sizes of scallops in a given area. 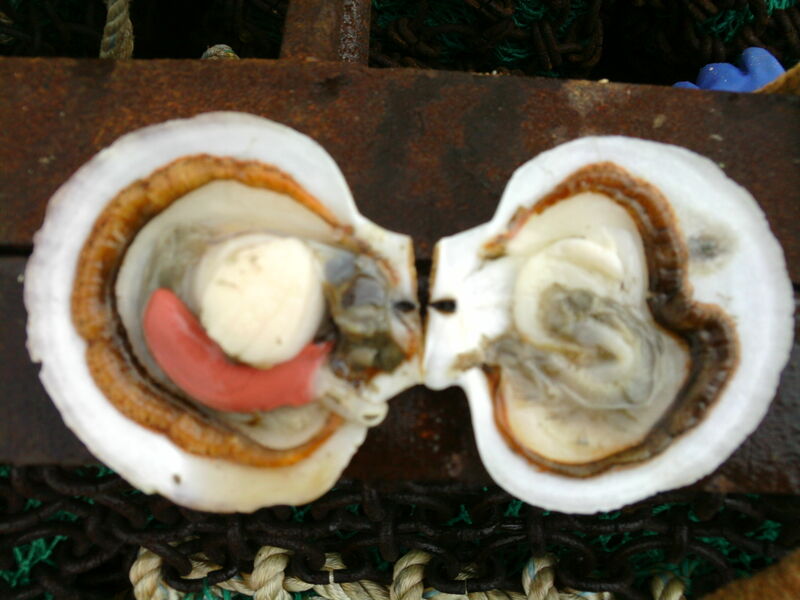 The commercial scallop fishermen are required to use the larger rings to allow smaller scallops to escape. The research dredge we used was equiped with a 1.5 inch streched mesh liner to keep other species, like fish, in the dredge because NOAA likes to measure and count them as well. Commercial scallop fishermen keep their dredges in for hours at a time. NOAA only keeps their research dredge in the water for 15 minutes at a time. There are several other dredge regulations that commercial fisherman have to follow. Click here if you would like to read more about the regulations. I also learned a lot about the anatomy of a sea scallop. The anatomy of a sea scallop. Thanks to http://www.seattlefishnm.com/ for the anatomy of a sea scallop chart. Sea scallops are either male or female depending on the color of their reproductive gland, called the gonad. 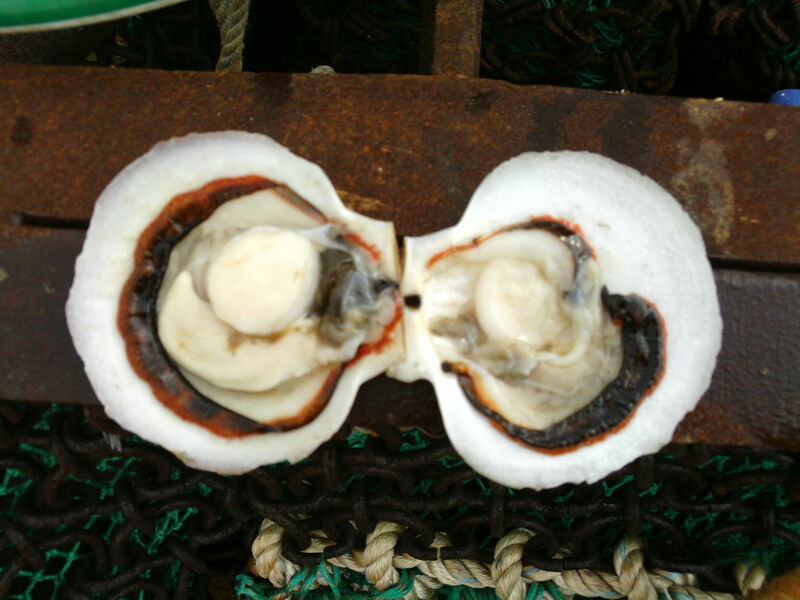 If a scallop has a red gonad, then that means it is a female scallop. If the gonad is a cream/yellow color, then that means the scallop is a male. 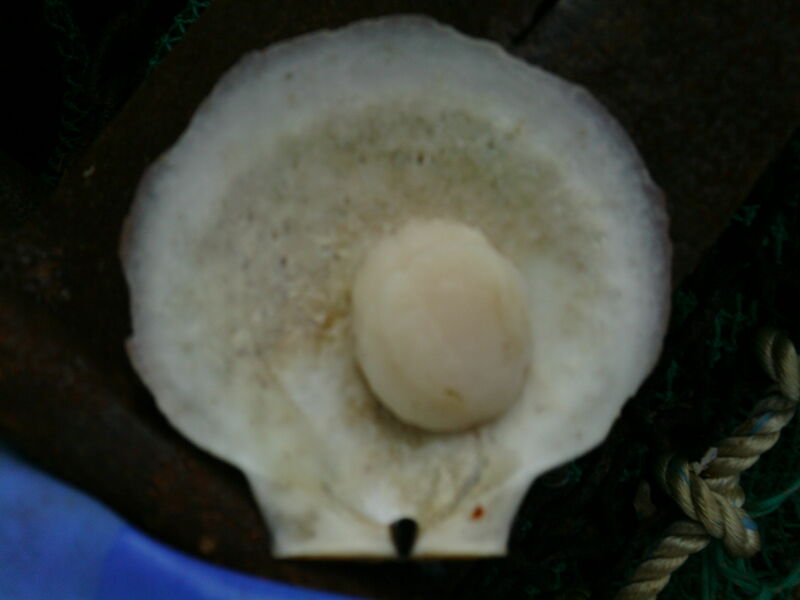 The scallop is connected to both sides of its shell with the large white part called the adductor muscle. This is the part that gets eaten. The adductor muscle is also the part that allows the scallop to clasp its shell shut. Scallops are also able to swim by sucking water into its shell and then quickly clasping the shell shut, which makes the scallop ‘swim’. The white chunk of meat is called the adductor muscle, which is the part of the scallop that most people eat. Scallops have eyes that line the edges of both top and bottom shells. See if you can spot eyes on the scallops below. Can you spot the eyes on this male scallop? Most of the scallops that we pulled up were only measured for individual length and cumulative weight, however some of the scallops were chosen to have their gonad and adductor muscle weighed, as well as their shells analyzed for age. The scallop was very slippery! This job isn’t very easy with gloves on, so I went without to get a better grip. Scallops are aged in a way similar to aging a tree. After the first two years of a scallop’s life, they are believed to grow a shell ring every year. In the picture below you can see how the shells age through the years. 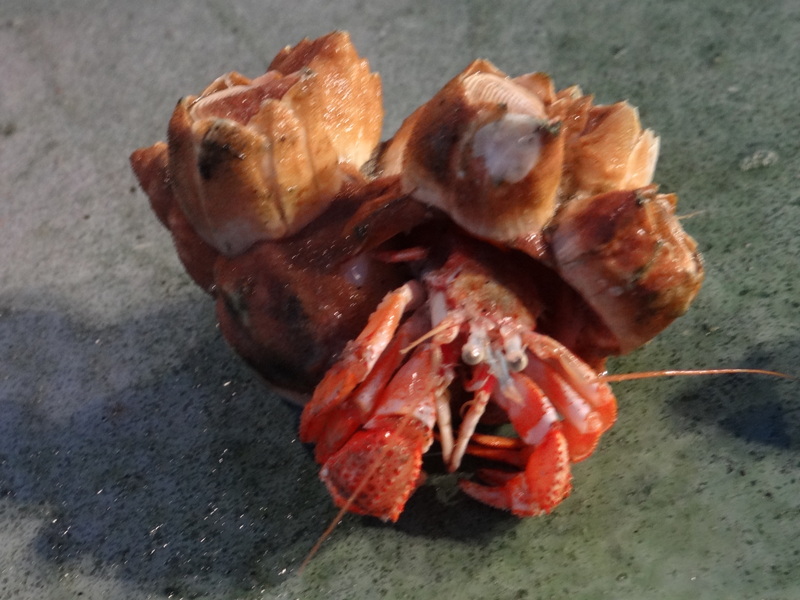 This hermit crab has barnacles growing in its shell. Seastars that came up in the dredge. 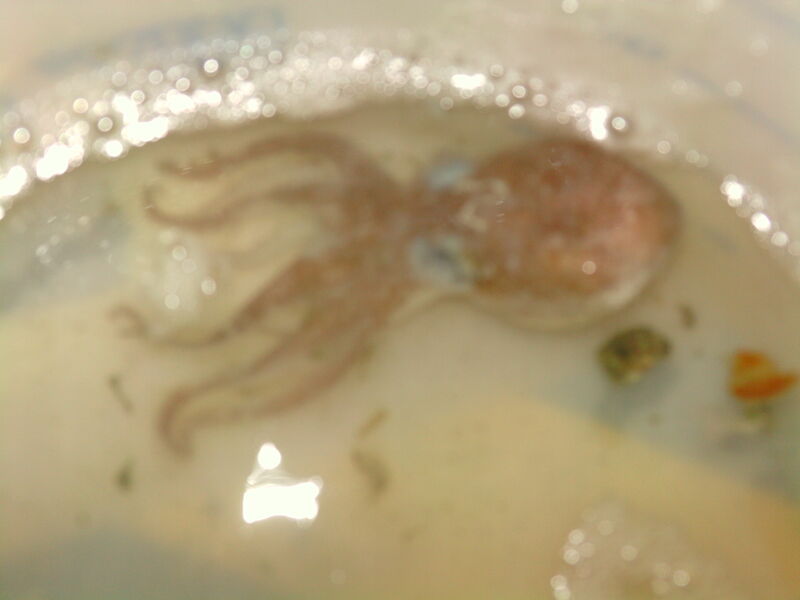 We put it in water to keep it alive while we finished sorting the table. This skate was so large that it did not fit completely on the measuring board. Look at the mouth of this skate. I really wouldn’t want to get my fingers close to it. On a happy note, we were able to get this skate back into the water before it died! 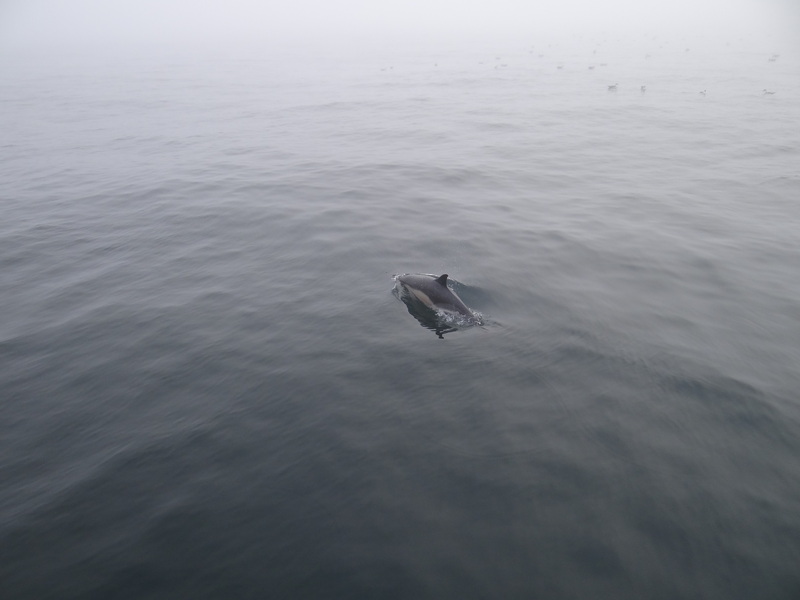 This dolphin swam right up beside the ship. Humpback Whales: The last night of the cruise we got to see the most amazing whale show. The pictures aren’t that great because they were a good ways away from the ship and it was right around sunset. I ended up putting the camera down so that I could just enjoy the show. Look closely at the splashes in the background of the picture and you will see the whales. This crab was kinda grouchy. You can see that it wouldn’t let go of a smaller crab’s claw. 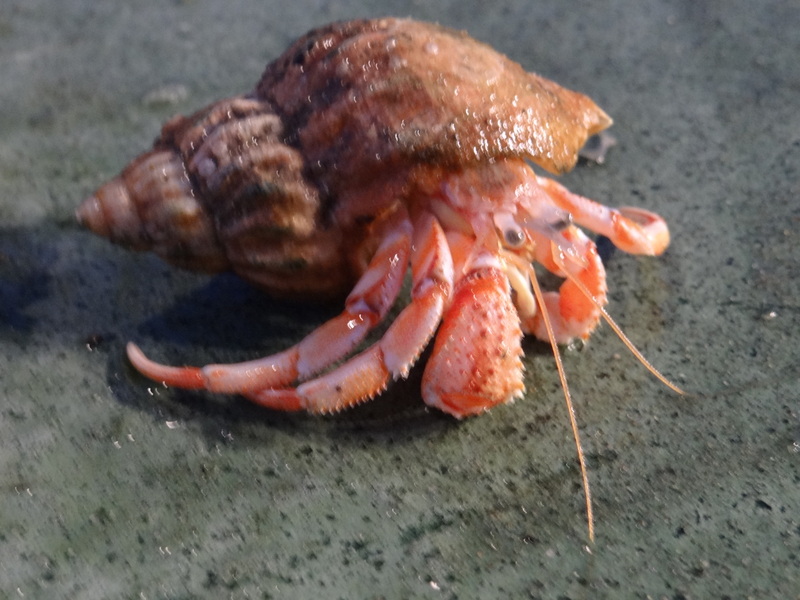 Did I mention that crabs freak me out a little because of the way they move? Sometimes the sea gulls seemed to walk on the water while they were landing. It is kind of eerie the way the fog will roll in all of the sudden. Can you see the birds? Somebody always has to get on top of the sorting table to shovel the dredge contents around to the those who are doing the sorting. Sometimes the dredge comes up full of anything but scallops. This dredge was full of heavy rocks! I was cleaning the shell of the scallop with a wire brush before shucking it to do a meat measurement on it. The scallops can come up really dirty with mud, sand, barnacles, or other organisms growing on them. We need to clean the shells well so that they can be accurately aged.